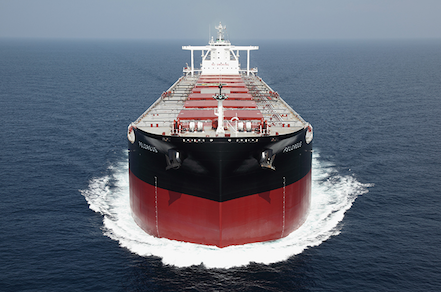 Brokers report that Star Bulk has sold three bulk carriers this week for around $110.5m altogether. The NASDAQ-listed shipowner is reported to have sold its capesizes Deep Blue and Indomitable (both 182,600, built 2015) to Greece’s Eastern Mediterranean Maritime for $38m each. The vessels were ordered en bloc in March 2013 for around $47m each, meaning the sales have incurred an impairment loss of approximately $9m per vessel. Today, Star Bulk has reportedly sold its capesize Leviathan (182,500 dwt, built 2014) to an unnamed buyer for $34.50m, brokers tell Splash. All three capes were built at the Japan Marine United shipyard. Star Bulk has one more capesize, Behemoth (182,000 dwt), awaiting delivery from the yard in 2016. Last month, the Athens-based owner sold two capes, Peloreus (182,500 dwt, built 2014) and Bruno Marks (180,000 dwt, built 2015), to South Korea’s H Line Shipping for a reported price of $40.5m each, a little higher than initially reported by brokers.